The alert issued a couple of weeks ago was not as strong as I thought although it is still in range. The markets did go down on July 25th but not as steep as I had thought. I was also looking for a geophysical event or terrorist activity but nothing of lasting strength occurred. This post will be a little shorter than usual as I recover from surgery. We should also be entering the 5th week of a new Primary cycle which started June 28. This is just 2 days away from Mars retrograde date. 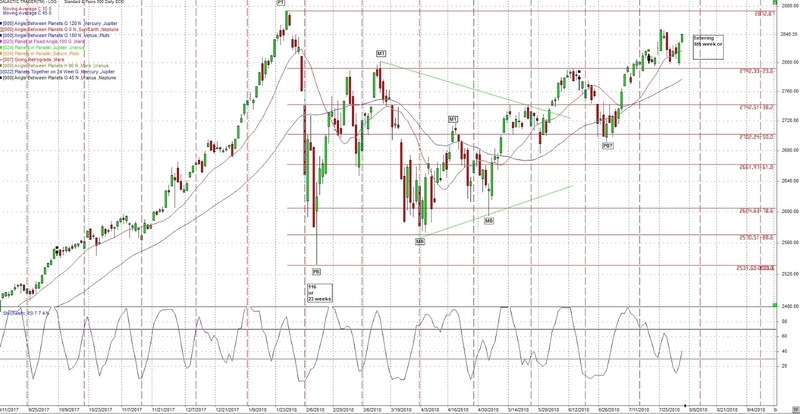 The Primary cycle often starts with a 6 week cycle so we may be looking for a pullback next week. Note the last high on Jan 26th at 2872.87. This could mark a high in the next few weeks. As noted by a number of Astrologers as of August 7th Uranus turns retrograde which results in 6 of the traditional 9 planets in retrograde motion (backward, or appears to be). It is unusual to have so many planets in apparent backward motion. By the end of September Mercury, Mars, Saturn and Pluto will have changed to direct motion. For those with a deeper interest in Astrology, Mars is Out Of Bounds until early October. 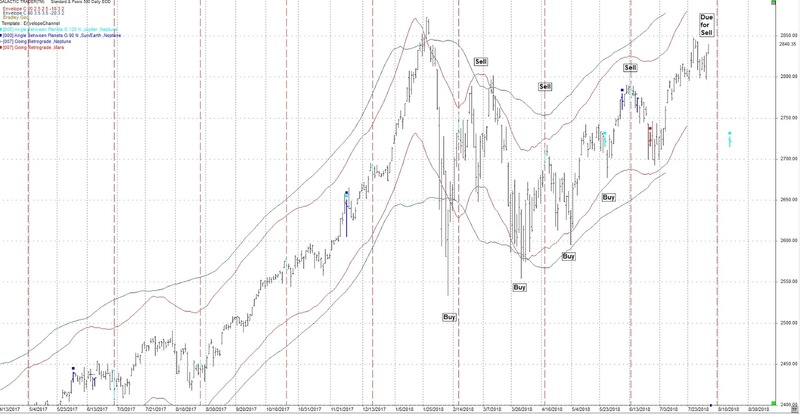 At the low of the Primary cycle on June 28th price moved lower than the 15 or 45 day sma”s. The 45 day sma was lower than the 15 day sma. These are the minimum low for a Primary cycle trough. Price has now moved above the 15 day sma and above the 45 day sma. The 15 day sma is above the 45 day sma. On a shorter term basis I track a 27 cd (calendar day) cycle which will be due Aug 18th. The 27 cd cycle are the red vertical lines. The 27 cd was a short term low. The blue squares on the chart show the Mars / Uranus squares. The last blue square was exact on May 16th and due to retrograde motion will be exact again on August 1, 2018 then Sept 18, 2018. The one black square is the semi-square of Uranus and Neptune, a long term signature. 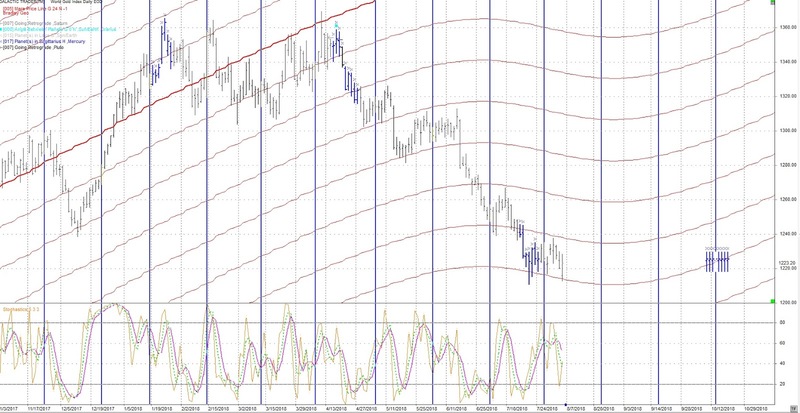 The above chart shows the 9 month or 39 week cycle (blue vertical lines). It was due and appears to have formed in late January. The 20 week cycle was added as well (red vertical lines). 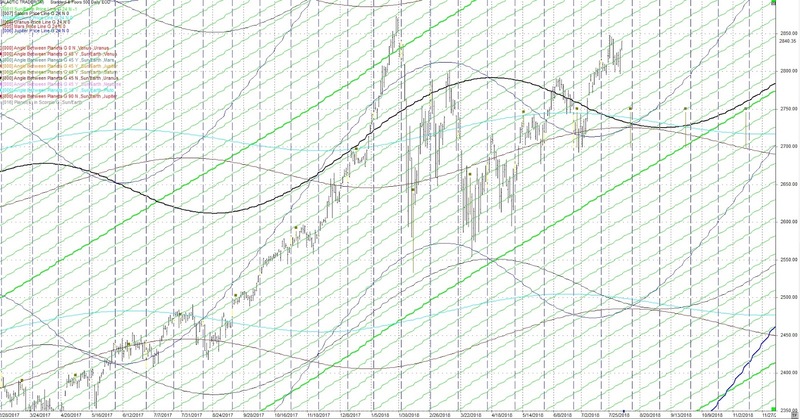 Any green lines are a combination of the 20 and 40 week cycles. Following are the significant earthquakes (> 6.0) so far in January 2018. There has been a number of volcano’s erupting as well. Japan and Hawaii. 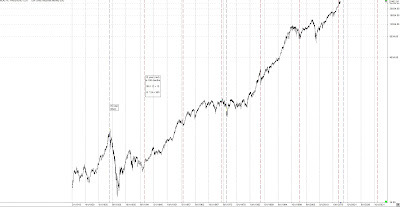 On a longer term basis the following monthly chart of the DJIA shows the 15 year cycle (red vertical lines) and the 45 year cycle (blue lines). The 15 year is due now, the 45 year due in Sept 2019. 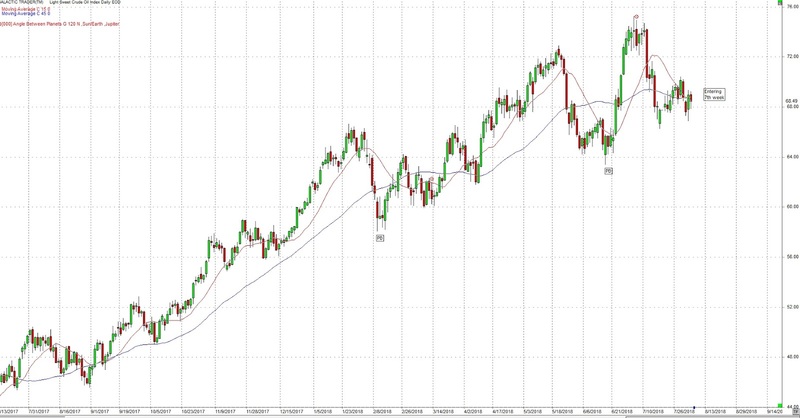 This is another example of a longer term cycle possibly distorting shorter term cycles. Bear in mind they need a broad orb. The 2nd last hit was March 29, 2018 and was a big range day. The last on June 27 was a big range day. The next dates are August 10th then Sept 25th. I have added 3 price lines to this chart. Note, on May 14 price moved up and was stopped at the Neptune price line (light blue). Note the date, Feb 9th, 2018 was the day of the low and a big range day. Note the recent dates. The Neptune Price Line (light blue) is acting as resistance. These price lines can act as support / resistance. It has been at highs and lows. Note also when they cross often gets a reaction in price on a short-term basis. Also note, near the top of the chart is a light blue line. This is the Neptune Price Line. Notice price just broke through the Saturn price line (the dark brown line). This may act as resistance so watch for the fist few days of next week. 20 week envelope channel. Blue is the centered 40 week envelope channel. 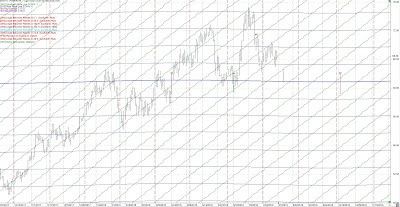 The dark blue squares are the Sun / Neptune square which is often a short term change in trend. See the Sun / Neptune square is June 7, 2018. We have had this noted it was due for a sell. The selling may have started. We are entering the difficult time mentioned over the last few months. From :The Book of Rules” circa 1928 for Uranus / Neptune aspects. Suddenly incapacitated, unconsciousness. Checkmated. Transition into the beyond. Crisis, dead persons. Revolution. Watch for lies and disagreements. 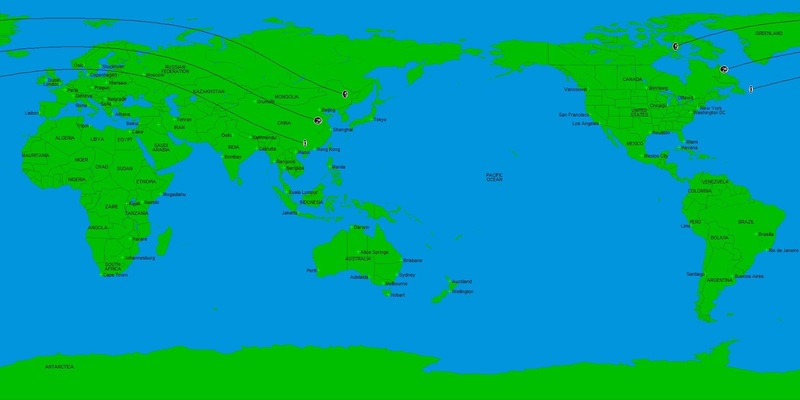 The eclipse starts in the eastern part of Canada and crosses the ocean, all of Europe and most of China and Russia. This eclipse shows a relationship to nuclear powers namely being the US and Russia. China and Russia have been forging strong economic ties. Does something happen at this eclipse or is it the beginning of some nuclear issue? Gold’s move lower four weeks ago was a surprise was driven by the decision of the EU to keep interest rates at lows into next year and EU quantitative easing will end his year. 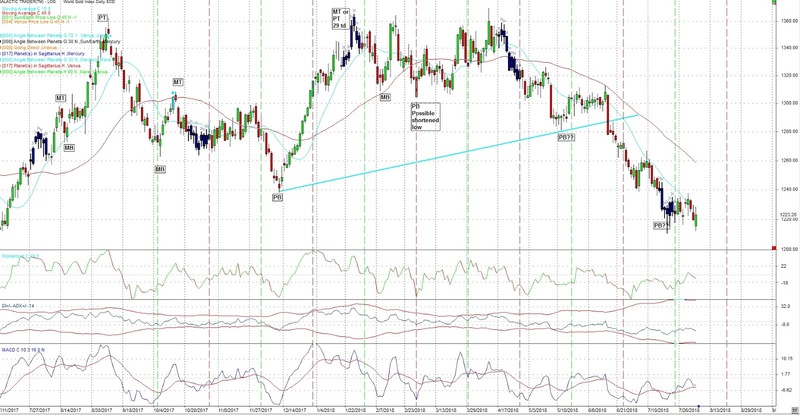 The above gave a boost to the US$ and the drop in precious metals was a result of it being largely priced in US$. Just a note; China and Russia continue their hoarding of Gold. The Primary cycle in Gold has been difficult to ascertain. There was a Primary cycle trough on Dec 12, 2017 but determining the next Primary trough has been very difficult. We may have seen a low on July 19th but it must be confirmed. This was where Mercury turned direct and Jupiter trined Neptune. These would be good markers for a turn in Gold. 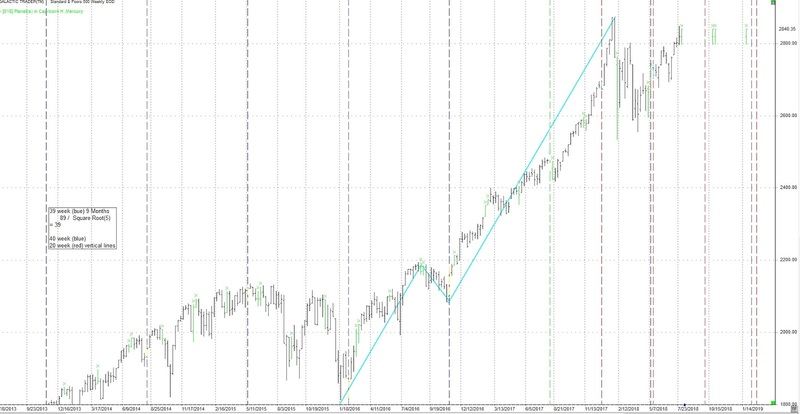 On occasion the Primary cycle can extend away from it’s more normal 18 week length. This looks like one of them. I’m looking for astrological aspects which have a history of changing the trend for Gold. Mars turning retrograde on June 26th may be astrological aspect which turns Gold. 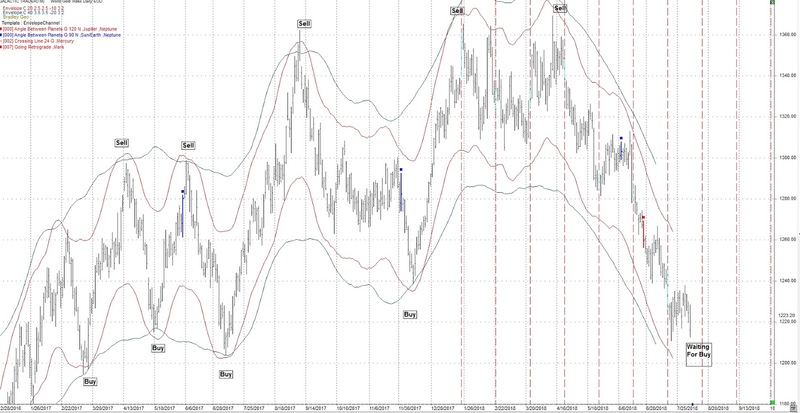 The chart has Gold looking to put in a Primary cycle low. 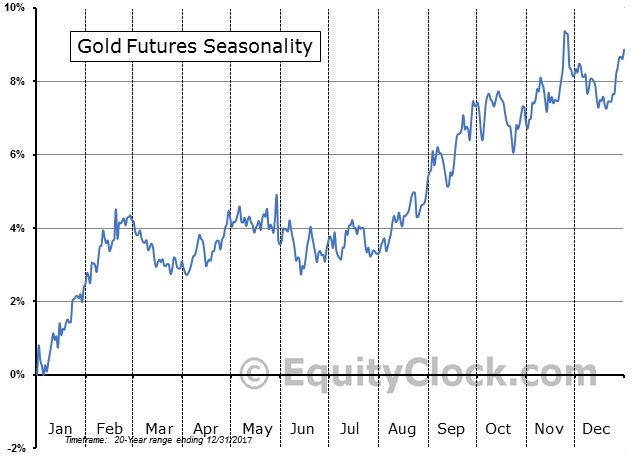 Seasonally Gold is usually flat over the early summer months with a history of moving up starting in August. The blue vertical lines are the 40 trading day cycle which hits July 6th. Price is below the 15 sma and the 45 day sma. The 15 sma and 45 day sma have crossed and appeared to roll over. The darker blue candlesticks show when heliocentric Mercury is in Sagittarius. 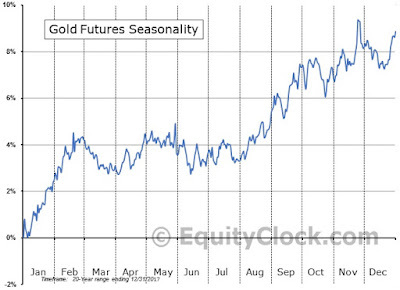 This is often a time of volatility and changes in trend for Gold. 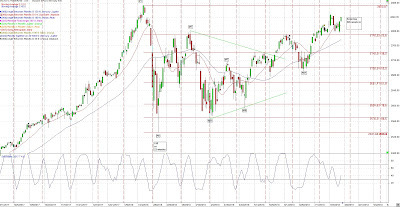 The following chart shows two daily envelope channels like the chart for the SP500 above. The blue squares are the Sun square Neptune which often results in a short term change in trend. We should be getting close to a buy. 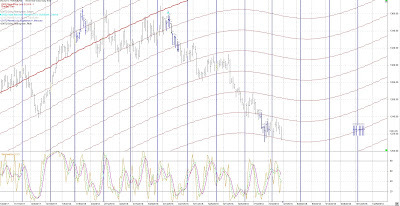 The following chart shows a 27 cd (calendar day) cycle (blue vertical lines). The next being Aug 21, 2018. The Moon takes 27 days to orbit the Earth and the Sun takes 27 days to revolve once at the Sun’s equator. The red lines headed up are the Mars price lines. 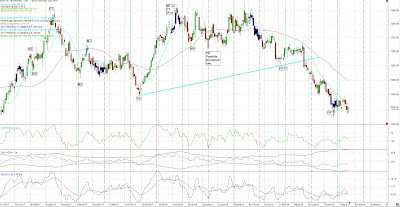 Gold has been moving sideways and now down since January 2018 and have found both resistance and support at the Mars price line. 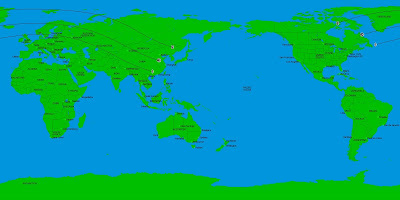 The darker red Mars lines are the main aspect. 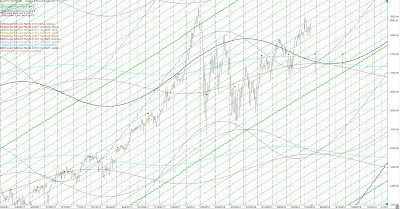 Moving below the dark red Mars price line was bearish now we need to move above the darker red Mars price line. It may hit resistance. Price did not go through the next Mars price line. Three weeks ago it bounced off the Mars price line. The small x’s on the chart show when heliocentric Mercury is in Sagittarius. 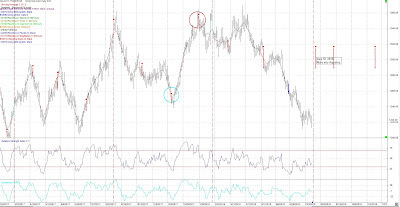 We often see changes in trend in Gold. Looking at this whole chart it is based on a 24 harmonic. If you count each line from one darker red line to the next you will find there are 15 of them. 15 * 24 degrees = 360 degrees. Note price went down to Dec 12 where it bounced off a Mars Price Line. The following chart shows when Mars enters a new sign. (red squares). The next date is August 10th but Mars is going retrograde at that time and will move backward from Aquarius to Capricorn. On September 11 Mars will re-enter Aquarius. On Nov 16 Mars moves into Pisces. Oil appears we have put in Primary low on June 18th and we are about to continue up or a top is forming from which we recede. We would be entering the 7th week of a new Primary cycle. I think we are 6 weeks along and in a new Primary cycle. We got the pull back we were looking for. Remember what I said about new Primary cycles. There is often a pullback in the 2 to 4 week range. We may seeing this pullback in crude. I’m leaning to June 18 being the trough of the Primary Cycle. This was also the date Neptune turned retrograde. Neptune and Jupiter rule crude. July 5 had the Sun trine Jupiter, another aspect affecting crude. 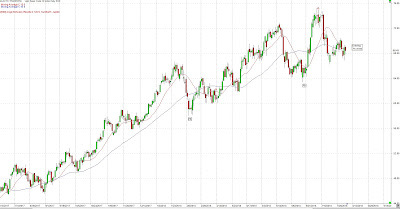 Crude price was below the 15 and 45 day sma on June 18th. There are many issues with Crude. The new Shanghai crude exchanged opened on March 26. This should have a negative effect of the Petrodollar (US Dollar) and possibly cause the US to lose it’s status as the world’s reserve currency. Watch this over the next few weeks / months. As Crude is sold in Yuan, purchasers are given the option to exchange Yuan to Gold. Yes there is a relatively new Gold exchange as well. They sell physical Gold rather than paper Gold as is often the case in the US. On Friday Crude was down as other commodities were also affected by the Euro moves. Crude started up on June 18 when Neptune turned retrograde. 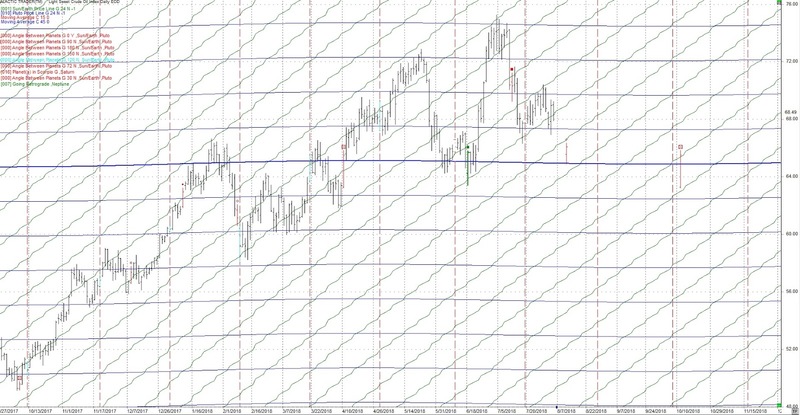 Note how price often follows the Sun price line up and often stops and reverses at the Pluto price line. We often get big range days. The next day would be July 24th. Welcome back sir. Mars will enter a new sign next week. Gold just rebounded from 1203 and closed at 1213. So should we go long here? I'm watching Gold but not buying yet. There is a strong signature, Jupiter / Neptune and then Mercury Direct on August 19th. There are a couple a little earlier as well. welcome back tradingdaze. glad to read you are ok. I get to have my other eye poked on August 21st. I may miss reporting on Aug 25. I will include a description of how envelope channels are calculated in the next post.